« What’s your beef with Tesla? Americans have a fascination with the weird sweet and salty fatty foods – from General Tso chicken to Hawaiian pizza. 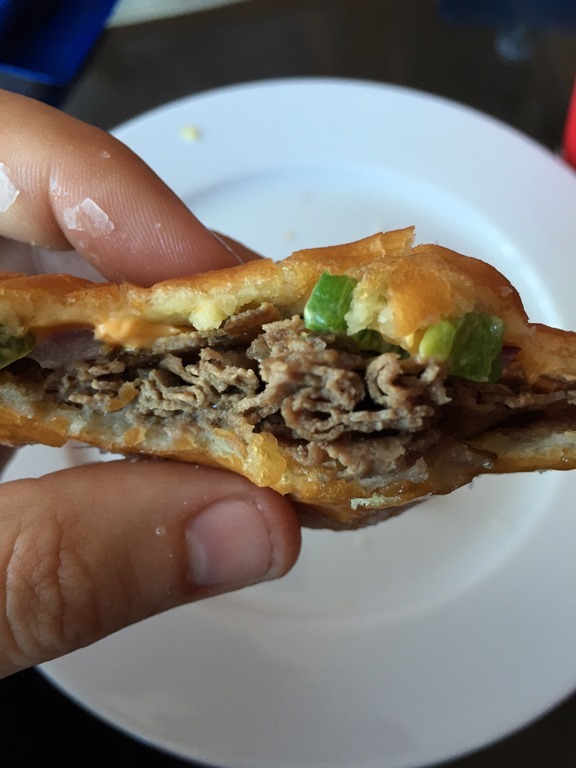 But that’s for ordinary people – taken to the extreme county fair levels you get a donut cheesesteak. 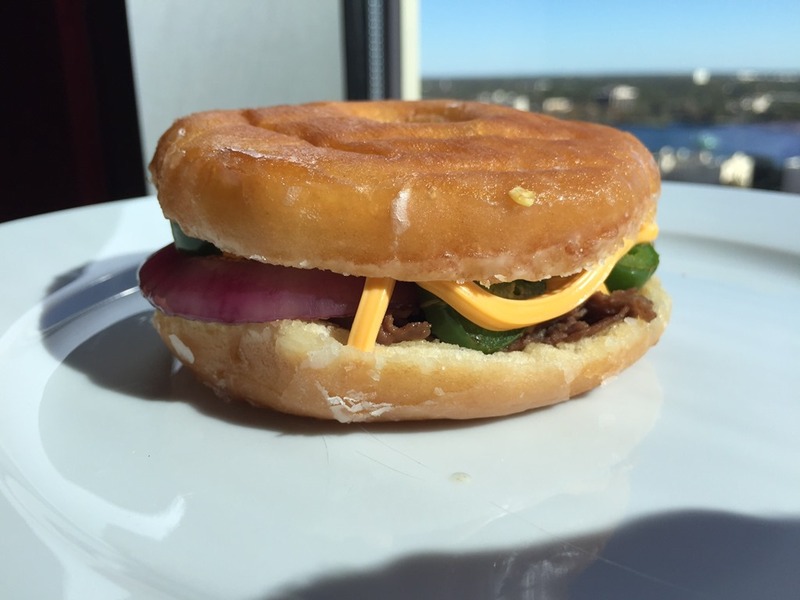 How exactly do you make a donut cheesesteak that doesn’t give you an instant heart attack? If that’s on your mind maybe you shouldn’t try this. Ever. Otherwise you start with your ingredients. First of all, whenever dealing with a mixture of weird stuff, start with the things you already like. I obviously ignored that when it comes to cheese because I had no way of melting it onto the steak without messing up my hot plate. 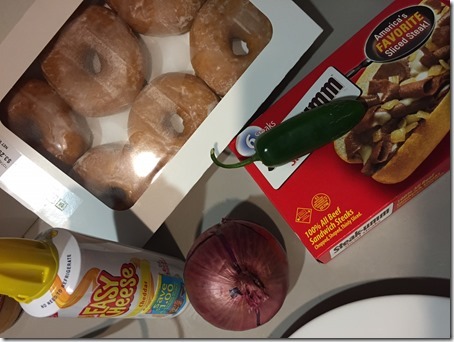 First: Freeze your donuts. In order to actually be able to hold it once it’s done you need to crisp it up. And unless you intend to make it with 2 donuts for buns (in which case you will only taste the donut) you’ll have to cut your donut in half which is only possible once you freeze it. Otherwise chop stuff up and drop it on the hot plate. It took about 5 minutes and bulk of that for the onion and the jalapeno. Slapped together and enjoyed the hell out of it. Honestly, it was really good! As will just about everything else. So take your negativity elsewhere, wuss. So at 380 calories (and likely less since you burn off a lot of sugar and fat while cooking) this has less impact to your daily diet than a McDonalds Fish Filet or the lowest calorie grilled chicken sandwich from Chick-Fil-A. Just in case you’re under illusion you’re eating healthy in a fast food chain. 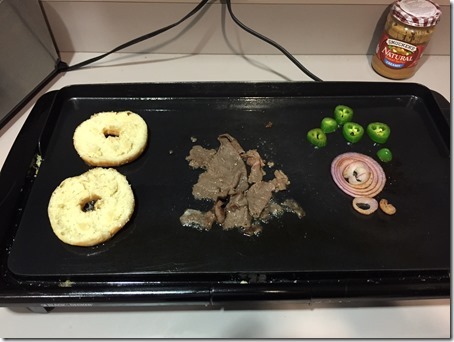 This week on “Donuts, Dogs and Vlad”, a guest interview with Alton Brown where Alton discusses how to remove burned-on Cheez-Wiz from an antique iron skillet. All on the Food Channel.